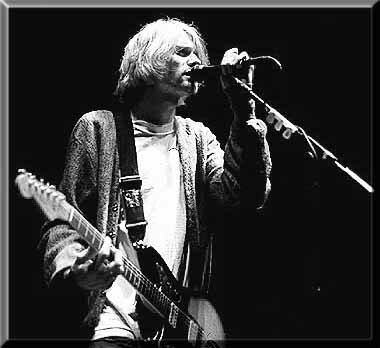 This site is a tribute to Kurt Donald Cobain, his life, his work and what he believed in. I feel compelled to join the many others, all over the world, in morning his death. 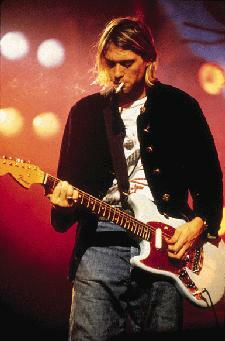 The story of Kurt Cobain is one of the sadest, most tradgic, yet true influences of my generation. I can relate so much to the way he lived, the things he believed in and the world he viewed. I think, that there are not many people in this world that can relate to Kurt or understand his way of thinking but i am one of them and if you are able to read his poetry and lyrics listen to his songs and "understand" you are too. Kurt reached out and touched our hearts, and that is where he will remain, forever. Peace, love, empathy. 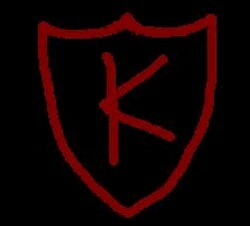 In this internet site i have tryed to cover as accurately as possible, the life, and, death of Kurt Cobain. There have been so many mis-truths, rumors, aligations and theories about one of the most talented artists this century has seen and lost. Many people don't know Kurt's story, unbelievably many people don't know who Kurt Cobain is/was. There have been so many atempts to control the story that it has gone un heard. A shrowd has been put around the whole subject and only people who have searched have been able to find the truth. Thanx to modern technology and many. many, many hours of reasearch i am able to produce it to the public. I am going to make sure that this site is promoted and shown to as many people as possible, that is if it is not deleted in another atempt to control the truth. There is alot of reading here, i have tryed to present all the facts and no opinions so you are able to judge for your selves. Please take the time to explore all of my site, even if you have to make several visits, read all the evidence for your self as it has taken alot of time and effot to produce and contains the story you are not ment to read. I think it is something that everybody should know about. The true story of Kurt Cobain. The next page "The life of a Legend" explains and portrays the background of Kurt. His childhood, how he grew up and his transition into the music world until the point before his death. The page following that "The death of a Legend" plots the tragic death of Kurt Cobain and the circumstanses that surround it, and a chance to read the actule suiside note written by Kurt. You can also see the documented evidence of the death for yourself, on the evidence pages, starting "All" the evidence ", including official police dept docutments and reports on Courtney Love and Kurt Cobain. Finally "The conclution" kinda wraps the whole story up, plus a chance to leave your own thoughts behind on this site. I recomend you read the pages in this order, when viewing the evidence pages please be tolarant as the pictures of the documents may take a while to load.